The Hopkinson Report » Episode 42: Victories and failures of social media in Super Bowl commercials. « Episode 41: Freshbooks.com interview – The â€œHead of Magicâ€ uses social media and retro marketing to build a loyal following. Episode 42: Victories and failures of social media in Super Bowl commercials. Ah, the Super Bowl. Two teams meet on the field, nearly 100 million friends gather to watch the game at home, and ad agencies are charged with making a breakthrough TV commercial in only 30 seconds. While those in the online marketing world live and breathe social media, we have to remember that outside our inner circle, there are still millions without Facebook accounts and that many think Twitter is a Looney Tunes character. In this article, I analyze which companies effectively drove their message home, and which ones fumbled their big opportunity. After all, a TV spot during the big game is expensive; extending that brand to your audience via social media costs far less, and is often free. E*Trade – The smart-talking baby commercials are hysterical, and may have just coined a new golf term, “shankopotamus.” You watch the spot, you laugh, and you know what the product is about. Upon arriving at the web site, there are links to view the commercials, including even more hysterical outtakes. 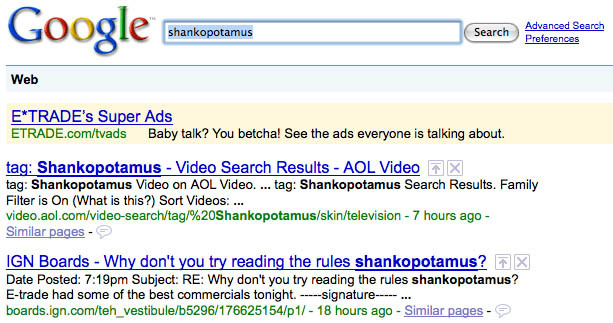 Bonus: E*Trade bought the Google keyword shankopotamus. Monster.com – The online job site had two marketing tactics, and they nailed them both. In the first, the “Need a new job” campaign was funny, and closes by saying that Monster has a redesigned website, with a call to action to check it out at Monster.com. Upon arrival there, they use clear, casually-shot online videos of employees to walk you through the new features. The second tactic was promoting their “Fandemonium” contest, co-sponsored by the NFL. The commercial was slick, and the microsite at NFL.Monster.com delivered. was no different. I’m guessing their brainstorming sessions didn’t go long before settling on “breast enhancement” and “computer geeks spying on women in a shower.” But as a test, I turned to one of my guests at my party, a Russian immigrant taking English as a second language and trying to keep up with the festivities, and asked her three simple questions. What is the name of the company? What do they sell? Where would you go to buy their product? She aced all three questions. The TV spot ended by urging users to visit their website to watch the “uncut” versions, and despite being a bit busy, they have plenty of step-by-step guides to get you started. Cash4Gold.com – This might be the definition of winning ugly. Ed McMahon looked like he is a step away from the grave, and MC Hammer’s serving as the poster boy for rapper’s excess has clearly jumped the shark. I won’t pass judgment on what message boards across the ‘net say about the legitimacy of the company (it isn’t good), but the intent of the ad and the website is crystal clear. A Google search, even using “for” instead of “4,” yields 3 sponsored ads at the top, Super Bowl specific ads to the right, and the # 1 natural search result. They’ve done their SEO homework. Careerbuilder.com – The “12 Days of Christmas” of hating your job commercial was entertaining, and you can’t miss the URL that brings you to their website. I found the landing page much less inviting than Monster, but quickly perked up when I saw their attempt at Facebook integration. Finally, some social media! 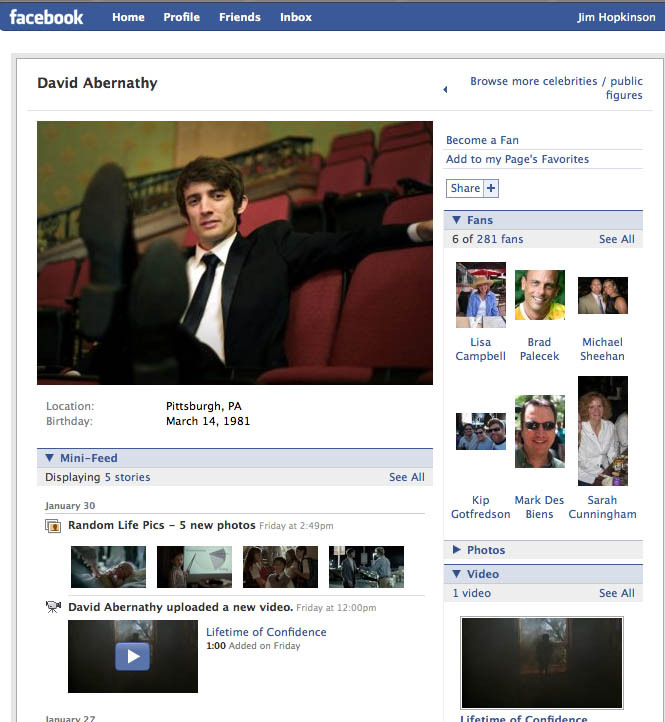 However, Facebook connect offers to a) bring my Facebook friends onto Careerbuilder, and b) let Careerbuilder post stories to my wall. I’m not sure I’d wish either of those on anyone in my network. Doritos – Were the commercials entertaining and munchie-inducing? Yes sir. But the call to action was the somewhat long and difficult to remember “snackstrongproductions.com,” with the worst part being that the URL redirects to Doritos.com! Why not just use Doritos.com!?!? Once you get there, forget it. The website looks like an over-produced blockbuster movie. We’re talking nachos here, people! Gatorade G Mission – Classic Gatorade. Peyton Manning, Tiger Woods, and other top athletes. The website? Um, I think I’m in the wrong place. Pedigree – The play-by-play: we’re off to a good start, with various zoo animals gone wild. The payoff line comes… “Maybe you should get a dog.” OK, that’s kind of funny. But who is this? Then they show the Pedigree logo, with a blue ribbon. I’m sorry, I’m still not sure who you are yet. Then another line, “The Pedigree adoption drive. Help us help dogs.” And… end. So what’s the problem here? I STILL don’t know who you are, and you ask us to help you, but don’t say how to do it! How can you NOT have a URL here? So I find my way to pedigree.com, and they have a decent website. And finally, a company with an iPhone app. But while they get props for Google keywords, they lose points for the one I saw that still had the placeholder “Ad Text goes here” displayed. Denny’s – This experience had all the back-and-forth as the game itself. The “Thugs” spot started out serious (is that Martin Scorsese?). Then it got funny. Then it got interesting… they are giving away a free Grand Slam breakfast to everyone in America. Great! But wait, no URL for more information? Is there a catch? How do I get this? Well, of course I figured out it’s just Dennys.com, and the directions are clear as day. All is well in the world. That is, of course, until I enter my New York City zip code to find out there isn’t a restaurant near me. Game over. After co-writing the article “Super Bowl Advertising 2.0” after the 2007 game, I had high hopes that the ads had progressed after two years of learning. Yet the arsenal of social media resources we use in the industry daily, Facebook, Twitter, blogs, online video, iPhone applications, and texting, went largely untapped. It’s clear that with 100 million people around the world tuning in, adding something like a Twitter address that is understood by a small fraction of the audience would dilute the message. But while the Twitter audience is small, aren’t they amongst the most influential? Why wouldn’t they want to reach this group of hyper-influencers? Oh wait… they’re probably going to write a blog post on it anyway. This entry was posted on Tuesday, February 3rd, 2009 at 9:54 pm and is filed under Apple, Branding / Advertising, Facebook, iPhone, Marketing Case Studies, Pop Culture / Entertainment, Twitter. You can follow any responses to this entry through the RSS 2.0 feed. Both comments and pings are currently closed.